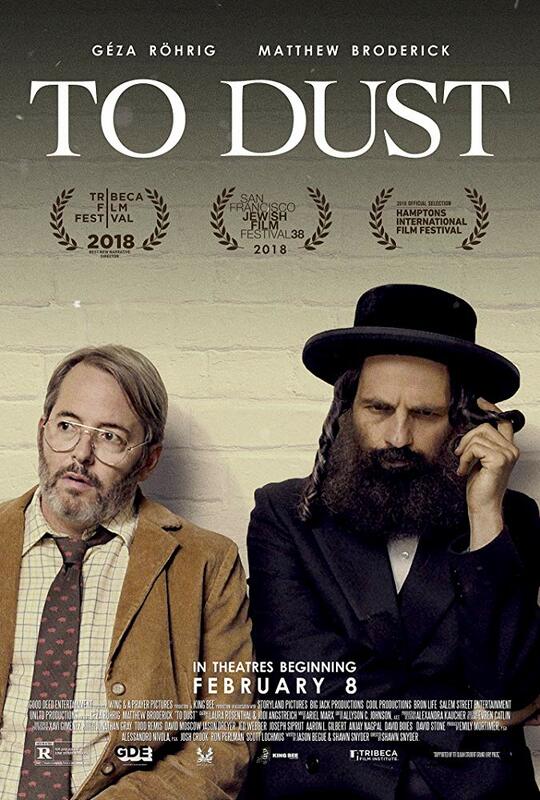 "Macabre Forensic Investigation Explores Questions of Faith and Science"
TO DUST is a weird black comedy about a widowed Orthodox Jewish man in New York who has macabre nightmares about his late wife’s decaying body and enlists the help of a reluctant biology teacher at a community college to conduct a bizarre gravedigging investigation. TO DUST has some funny, intriguing moments, but it’s ultimately unsatisfying and contains lots of unnecessary foul language and scenes of death and decay. The movie opens with some Jewish women washing the body of a synagogue cantor’s late wife. The cantor, named Shmuel, is having macabre nightmares about his wife’s decomposing body. He comes to believe that her soul will not rest until her body completely decomposes. In a desperate search for consolation, which he hasn’t gotten from his rabbi, he goes to Arthur, a bumbling biology teacher at a local community college, to find out how long it will take for his wife’s body to decompose. At first, Arthur is too freaked out by Shmuel’s questions, but Shmuel is clearly distraught. So, Arthur consults a scientific book discussing the decomposition of pig corpses, because a pig’s physical body shares certain important similarities with a human being’s. However, Shmuel continues to have disturbing nightmares. So, he steals a large pig from a farm and brings it to Arthur’s house one evening! Shmuel insists that Arthur should be the one to kill the pig. Shortly thereafter, Arthur and Shmuel are sneaking out to the woods to bury the pig’s corpse. Thus begins a macabre investigation into death and decay that raises questions of science and religion, and the intersection between them. TO DUST may sound more profound than it turns out to be, but it’s actually more macabre, weird, absurd, and comical than profound. Some of the twists are funny, such as the scene with a huge squealing pig running around the biology teacher’s cozy little house. Or, the scene where Arthur and Shmuel run into a friendly female Christian security guard at a scientific facility that conducts forensic investigations on human corpses decomposing in a large empty lot with trees, grass and mud, surrounded by a high wall. According to several online Jewish websites, some religious Jews apparently believe that a person’s soul lingers near its dead body for 12 months, until the body totally decomposes. Then, God takes the soul into Gan Eden, where the very righteous go, or Gehenna, where the unrighteous go. Most of the unrighteous allegedly will be purified in the fires of Gehenna, but whether righteous or unrighteous, the person will be resurrected when the Messiah appears, whereupon the Messiah will render final judgment on them for the World to Come. In the movie, therefore, Shmuel is worried that his wife is suffering immensely while her body is decomposing. That’s why he’s having nightmares about her. Without giving anything away, the final resolution to Shmuel’s own suffering in TO DUST turns out not to be very satisfying. In fact, it’s hard to see how his solution to the questions he has about his wife’s suffering really solves his problem. It doesn’t seem to be very comforting to MOVIEGUIDE® or this reviewer. Ironically, the Christian security guard’s simple Christian greeting and blessing to Shmuel and Arthur in the above-mentioned scene seems to offer a better avenue of exploration for the two men trying to ease Shmuel’s pain. Thus, the beautiful hint of Jesus she offers in her blessing to them in that scene echoes the abundant life Jesus offers to everyone who follows Him, instead of the death and decay with which Shmuel and Arthur are wrestling. TO DUST also contains lots of R-rated, strong foul language and some gruesome, macabre images of death and decay. Finally, its presentation of the intersection between science and faith doesn’t offer much in the way of useful, enlightening insights, much less any truly inspiring insights. Perhaps, if the writers and director were more familiar with the philosophy of religion and the philosophy of science, their movie could have been more worthwhile. Despite the humor, and its occasional absurd charm, TO DUST is too weird, profane and unsatisfying. Some lying, man has nightmares, distraught father upsets his two sons, man steals a pig to kill it and see how long it takes for the body to decay and decompose. TO DUST is a weird black comedy. A Hasidic Jewish cantor in New York named Shmuel is having macabre nightmares about his late wife’s decomposing body. He comes to believe her soul won’t rest until her body completely decomposes. In a desperate search for consolation, he goes to Arthur, a bumbling biology teacher at a local community college to find out how long it will take for his wife’s body to decompose. Together, they launch a macabre but often funny investigation into death and decay that raises questions of science and religion, and the intersection between them. TO DUST may sound more profound than it turns out to be, but it’s actually more macabre, weird, absurd, and comical than profound. Some of the twists are funny, not just macabre. The final resolution to Shmuel’s own suffering in TO DUST turns out not to be very satisfying. TO DUST also contains lots of R-rated, strong foul language and some gruesome, macabre images of death and decay. Despite the humor, and its occasional absurd charm, TO DUST is too weird, profane and unsatisfying.